This has been on my mind for a little while now. Where I live, there isn’t a cohesive group of models. Finding work for a model, especially a new one, can be daunting and a bit depressing as I found when looking for new work. I thought that there could be a better way, a way of having a place, even if it’s virtual, for models to have their info, ideas, tips, etc. to help themselves and others along with the info of all the different drawing groups in the area both so they could be know to artists but also so they could contact and hopefully hire new models. When speaking to many of the places I have modeled, it is a constant complaint that it is difficult to find models, or at least reliable ones. I am hoping to build this group into one where the members take their modeling seriously, and work to erase the stigma and idea that models can be flaky, cancelling at the last moment, or just not showing at all. It would be nice to also have the member models be ones that have a passion for figure modeling and are not just trying it out to cross it off a life’s bucket list or just decide that after a few times, it isn’t for them. New models can have educational tips and contacts for any questions they may have. I hope to partner with a gallery or drawing group a few times a year to help train new models, to make sure they are capable of modeling. I still have the view that anyone can take their cloths off, as long as they have the nerve to do so. What is also needed are those who put thought and effort into their poses and work not to be bland, drift or break the poses. I’m sure that starting this new effort may ruffle some feathers of those who think the current system is working. The current system being new people pop up who want to model for whatever reason, good or bad, don’t know where to look for work, and once a group takes a chance on them, they may or may not show up to the session and if they do, there is a high chance that it won’t be all that good. Also, anyone who is serious about modeling and wants to find more work has to rely on artists or group coordinators to pass along their information. While the world is full of good intentions, a model cannot guarantee that this will be happening. I personally like to contact new places myself. While I do not discourage anyone from passing along my info to those they know may be hiring, I don’t hold my breath that something will come of it. I know that some established models may also look at it as a bit of a threat. Being established and well known, some people don’t want the competition of new models, especially ones that may be good, cutting into the bookings they are currently getting. Depending on the number of venues where you live that offer figure drawing mixed with the number of models and sessions available, the more established models that some groups have been booking, possibly more because they are reliable than anything else, may start to find their number of bookings decrease. I hope that this mindset isn’t the case but have to be prepared just in case. I’m interested to see if this idea will take off and grow. I suppose only time and effort will tell. Business cards, i can’t say enough about them. Things are picking up and this is due to my continued research into local figure drawing groups but also, due to the business cards I had printed up and have been handing out or leaving at different venues that I have modeled at. These things are spreading like the Ebola Virus! I talked a while ago about self promotion and getting new work and mentioned that I had a set of business cards done up for me. VistaPrint is always giving out offers of 250 free business cards, you just pay shipping. Well, for about $15 in shipping costs, I had this number of cards done up for me, and they look great. You can choose your graphics, layout, what to add for info etc. It was great and when they arrived, I was really impressed. While this isn’t a specific plug for VistaPrint, it is a plug for any model who is trying to find work, to get business cards printed up and start handing them out to anyone remotely interested in you or finding figure models. So far I can safely say that about 50% of the sessions I have booked have been because of the business cards and the other 50% from me cold calling/e-mailing groups about their figure drawing nights and classes. I am happy to say that I have now started to get repeat bookings from groups (again who contacted me because of the cards and cold calling), and that I wouldn’t be nearly as far a head meeting local artists and groups, if I hadn’t gotten them printed. I was pleasantly surprise to be contacted by a new group last weekend to fill in at the last minute for a model who cancelled. While I called back too late to get the next day’s session (they had found a model thankfully), I was asked about my availability for the weekend after and was booked. It’s a new group that I have never modeled for nor knew they existed, all due to them having a card of mine. I don’t even know if I handed it to the model coordinator personally or if it was picked up at another location. Either way, it’s a bonus. Well, I have run into instances where models have been no shows (leading to my opportunity to model instead), and other things but I haven’t mentioned my experience with the “double booking”. While a model pulling a no show, burning an artist or figure drawing group in the process is much more common, I experienced a double booking, something I was not prepared for, but I think the situation was handled very well. 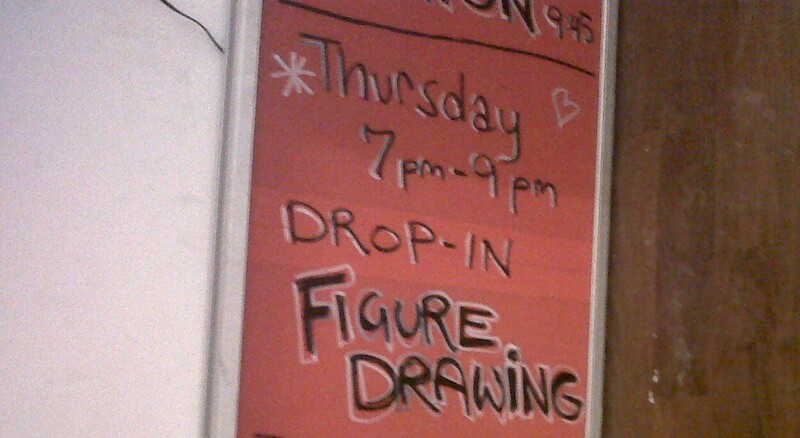 I turned up to model for a weekly drawing group that I had modeled for before that night. Recently, they had changed coordinators for the drawing group and I was happy to be contacted by the new coordinator. I was also happy to accept the invitation to model for them on the agreed date and that was that. I showed up early, as I like to do, and when I arrived complete with my modeling bag and hiking staff, I was greeted with a “Oh, I think we are double booked for models tonight.” I also had a chuckle that it was mentioned that they weren’t going to argue with me about who was going to stay to model as I came armed. It turned out that the former coordinator booked a model for the new coordinator without mentioning it. Of course, the new coordinator booked a model, me, as she thought no one was booked. We had a good natured laugh about it. The new coordinator apologized a number of times about it, I told her that it was no trouble. The other model and I worked it out between the two of us. I offered for her to model that night and was going to ask the coordinator just to book me the next week or within a couple of weeks instead. The other model decided she wanted the night off instead, and I modeled that night and she booked for the next week. It was nice to be able to work something out so easily and quickly. I know that some people would get very upset by something like this (I could see it if it was an occurring issue) but I was pretty happy to come back another week. It got me thinking about if it was the venue, the people involved or something else that made this an easy, amicable situation to solve. I know other places and situations could have become heated, someone would get annoyed by lack of “professionalism” and other things. I think that it mainly had to do with the people involved and the type of people this art group attracts. Very laid back, very communal type people. I love modeling for them just because they are such a happy group. They chat to each other during the drawing session, helping each other out with techniques or just generally chatting. As I have mentioned, some models or other artists may find this distracting or annoying but I find it refreshing. I love to “eavesdrop” on the conversations, I have a great chuckle at a lot of what is said and find the process to be very organic and energetic. I hope that if I am ever in the same or similar situation with another artist or drawing group that there would be a similar cooperative outcome.